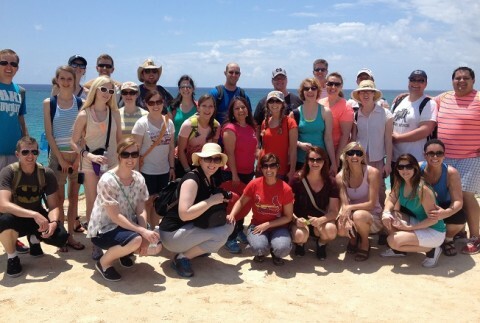 I take groups of LDS singles to tour the ancient Mayan ruins in Mexico and Belize. We tour these ruins with an LDS perspective. We use a cruise ship to transport us to each of the ruins. I take 2-3 groups of LDS singles on these ‘Book of Mormon Cruises’ each year. Click here for details of our upcoming LDS Singles cruises and other tours. One of the Mayan cities we visit is the beautiful city of Tulum which is located in Mexico. Getting to Tulum can be kind of tricky when you are traveling on a cruise ship. The ship docks on the island of Cozumel and Tulum is on the mainland of Mexico. Once off the ship, we need to take a taxi into town and catch the passenger ferry which takes us on a 45 minute boat ride to the mainland. Once there, we wind yourselves through a crowded marketplace to the main road where our bus is waiting to pick us up. We then take a 60 minute bus ride to Tulum. Once the tour is over, we have to do everything in reverse to get back to the ship. Cruise ships don’t wait for anyone, and the passenger ferry is on a limited schedule. We must catch a particular ferry or we will miss the cruise ship. Wanting to maximize our time at Tulum, a well thought through schedule must be kept. We have never had an issue of running behind, or being in danger of missing the last ferry…except for that one time we needed to run from the Mexican police in order to make it back on the cruise ship! Everything was going as planned that day. We were off the ship and down to the passenger ferry on time without any problems. Our bus was waiting for us as expected on the other side of the ferry ride. We arrived at Tulum and had an amazing experience! Tulum sits atop a cliff overlooking the gorgeous Caribbean Sea. The site is incredible. The tour of the ruins, from an LDS perspective, is remarkable. These people understood so many truths that we as Latter Day Saints believe in. We maximize our time at Tulum to gain the full experience and value of our time there. We left Tulum on time, as scheduled, and walked out toward our bus. Everyone grabbed a seat and I did a final head count before the bus was to pull away. We were one person short! Tulum is a very touristy place. There are people everywhere! There can be a lot of confusion because of the number of buses and people. It is easy to get lost. Kellie was lost! Some of the girls thought they saw her going toward the restrooms as we were walking out to the bus. The restrooms were about 200 yards down the road. Luckily, I had given ourselves a 20 minute buffer to make the ferry. As long as Kellie was found within 20 minutes, we would be just fine. I sprinted toward the restroom without seeing her. I looked around the area of the restroom without any luck. Hoping that I passed her without noticing, I sprinted back to the bus. No sign of Kellie! Our 20 minute buffer was now down to 8 minutes. I sprinted back towards the restroom. Still no Kellie. I sprinted back to the bus. Still no Kellie. Our time buffer was now at negative 5 minutes. If we left now, without Kellie, we would miss the ferry by 5 minutes. Luckily, one of our local tour guides was running late that morning so he drove his own car to Tulum instead of riding on the bus with us like he always does. The plan was for me and him to keep looking for Kellie while sending the rest of the group on their way with little hope that they would make the ferry in time. I always buy the ferry tickets for the return ferry ride after returning to the ferry dock after touring Tulum. I never buy them early because I don’t want to risk losing 50 tickets. For some reason, this time I had pre-purchased the tickets! I handed them out to those on the bus and then instructed the bus driver to leave without me and Kellie and to go as quickly as possible to the ferry which was a 60 minute drive away. We were now 40 minutes behind schedule, which meant we were going to miss the ferry by 20 minutes and ultimately miss the cruise ship. On my way out of the bus, I half-jokingly said, “Don’t you Mormon’s believe in prayer?” And in unison, everyone seemed to shout, “We’ve been praying!” Jason jumped off the bus with me and offered to help look for Kellie. Jason and I ran in different directions. As I was running, I had the thought that Kellie was probably looking for the bus where the bus had dropped us off. In hopes of saving time, the bus pick up location was different then the drop off location. I turned a corner and ran toward the place the bus had dropped us off at. Just as I did, Kellie and Jason turned the same corner running towards me! Jason yelled, “She was were the bus had dropped us off!” Of course. The three of us jumped into the car our tour guide was driving with a prayer that something would work out. The panic running through me can’t even be described! I was thinking through options of how to get the three of us to Belize by the next day to meet up with our cruise ship. I was panicking with the thought of what I would do if no one made the ferry! Our tour guide was speeding through the streets, then suddenly pulls off the road. His car was running low on gas and we would need to stop to fill up!! Once we were back on the highway, our tour guide hovered around 100 miles per hour. We were racing down the highway as if we were playing Frogger by sliding in and out of lanes to get around cars. Our tour guide said that we would be fine because the President of Mexico was in Cancun at a conference so all the police were in Cancun. He told us we did not need to be worried about being pulled over. Being pulled over was the least thing I was worried about! We pulled into the drop off area right behind our bus. I jumped out of the car before it even stopped and I directed everyone to run as fast as they could to the ferry. I instructed Jason to run ahead and do whatever he could to delay the ferry. I stayed behind to be the last one in line which gave me a perfect view of the ensuing chaos. Imagine 40 Americans sprinting in a single file line through a very crowded Mexican marketplace! The scene caught everyone’s attention. As the last member of our group got off the bus, he thought he would make light of the situation by yelling, “Run! They’re after us!” This got the attention of the 8 Mexican police officers standing on the opposite side of the street. They all started to blow their whistles and yell at us to stop. I turned and looked at them, then I looked back at my group of 40. Some in our group stopped as instructed and looked at me to know what to do. I looked back at the police as they were starting to cross the street, I thought about our departing ferry, I turned back toward the group and while motioning for them to keep going, I yelled, “Keep running! Keep running! Don’t miss the ferry!” As I came around the corner and looked down the hill toward the ferry, I saw Jason pleading with a worker to wait for us. I saw Jason with his hands together as though he were begging them to hold the ferry, then I saw him point toward me, before returning to his begging position. The ferry was scheduled to depart at 3:00. We boarded at 3:04. Since this time, we have put rules and safety nets in place to make sure we never come close to recreating the day we nearly left Kellie in Mexico and ran from the police!